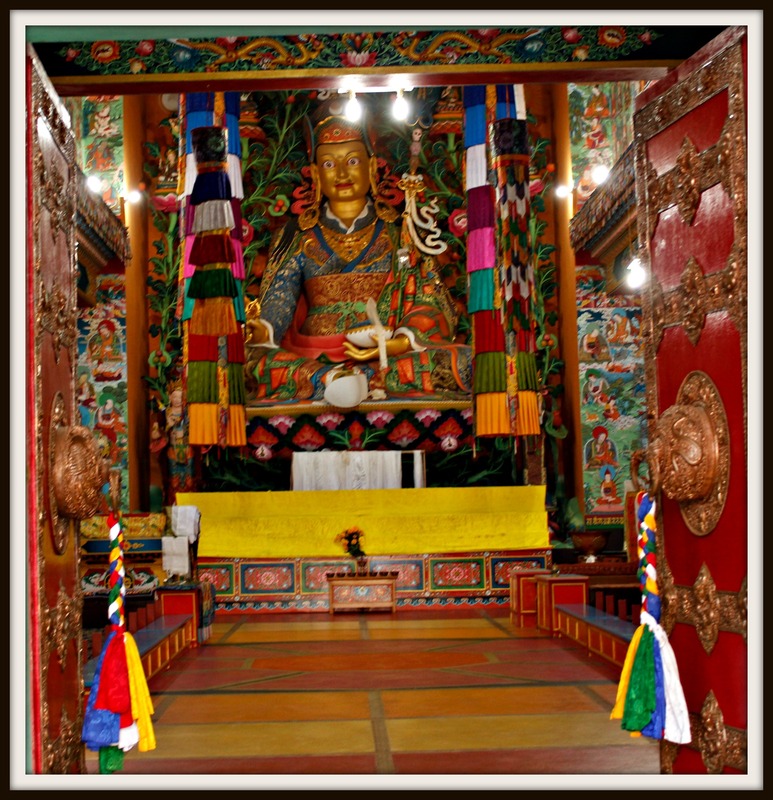 Tawang – A Cultural Perspective of the land of Buddha. Tawang is well known for its Buddhist Monasteries or Gompas. I have had the fortune of living and travelling with a Buddhist couple for a few days I was there gave me a first person insight into many of their believes, practices and faith. The study of the religion from the eye of a local practioner had given interesting glimpses, an understanding different from reading books and a quest to know more. The huge golden Buddha statue of Tawang Monastery has represented Tawang for a long time. This monastery also houses a museum which has artifacts of dress, jewelry, musical instruments and utensils used in the past. It also features the escape route of Dalai Lama from Tibet into India and also other dignitaries like Nehru, Indira, Rajiv and Sonia who had visited the monastery while in office. Tawang Monastery or Gompa also houses the homes of the lamas and their school where they study culture, religion and Languages. Lama are buddist brahmacharis i.e men who have owed celibacy for their lives. I learnt from a local Buddhist that when a Buddhist family has three male children, they are to enroll their second male child as a lama. In this part of the world where having 3-4 children is still the norm, I suppose most Buddhist homes may have a lama. These rules do not apply to the girl child and the women lamas or ani have been enrolled purely voluntarily or due to family circumstances like poverty. These children join the residential lama schools as early 5 years and stay there the rest of their lives. I was told that the children who study in these schools come from as far as Kerala and various other states as well. Gompas or monasteries are separate for the men and women and the Gompas for women are called the Ani Gompas. Tawang has two beautiful Ani Gompas just a little away from the Tawang Monastery which is a gompa for the men. We also visited another Gompa in the Khimney Village which is a mens Gompa as well but a different and a slightly more moderate thought. While the lamas in tawang monastery can never walk out of their chosen path of celibacy, the lamas here are allowed to pay some penalty to compensate for the expenses undertaken by the gompa in their upbringing to give up their lama hood and get married. But it is widely believed to be an act of sin that will be punishable in the court of God. Every Gompa has a painting of satan or devil like person around whom the various sins and punishments for the same are represented in the paintings. It also talks about how the good reach heaven and then how we are made to suffer for our misdeeds. The punishments like putting inside a boiling oil pan, hanging a person upside down etc, which reminded me of same/similar punishments that are captured in the garuda puranam of the hindus. I was told if I can touch the two big toes of the devil at the same time with both my hands would mean that I do not have any sins in my name. The Tawang monastery also had a huge pillar in the open, much like a structure in the hindu temples. I was told if I can touch/hold both my hands around the structure then I have not done any sins. Another test was if I can place a coin on top of the Golden Buddha head. I ofcourse failed all the three tests and concluded that to be of no sin, I must get bigger arms and a better aim. Buddhism is broadly classified into Mahayana and Hinayana Buddhism. Hinayana believes in Buddhahood or bodhisattva as a status that can be attained by all by their own effort. They do not consider any one as God including the Buddha and ae strongly against any form of idol worship and symbolism. Mahayana Buddhism had adopted many Hindu symbolisms including deity worship and have numerous deities including some Hindu Gods. There were many striking similarities between Hinduism and Mahayana Buddhism, with deities having the third eye like siva and even a god with elephant face like Ganesha. I later understood that Mahayana Buddhism recognized the three big gods of Hinduism, Brahma, Vishnu and Siva with the duties of creation, protections and destruction but they did not have a deity like status however Ganesha, god with the elephant head has a deity status and is considered as a deity who removed obstacles which is the same as what Hindus consider him as well. The Buddhism practices in Tawang are strongly influenced by the Tibetan Buddhism and consider Dalai Lama to be head Lama as against the Buddhists in Bhutan who have a cultural head of the state from the monastery and have an enemity towards Tibet that spans many centuries and territorial conflicts. We also visited another gompa (monastery) on our way back from Madhiri Lake which was constructed by someone in the memory of his mother. I was told that the rocks there are holy and each one has a story which is given in the scriptures and as they did not have that book in hand, they were unable to narrate it to me. But we did take some delicious cucumbers that were left as offering for the rocks. The offerings in Gompa were another thing that left me stunned. Because it had not just fruits, flowers but also candies, vanaspati, oil, vegetables, flour etc. I remembered that some big Gompas in Singapore had even fresh meat as offering. I was told that recently it had been declared by the local monastery issued a doctrine banning eating of meat and declared it as anti- religious and so our hosts who had been eating ducks, chicken, mutton and beef had turned vegetarians. It was really surprising to me that people could change their food habits over night because their place of worship said so or so was their belief. Even for a staunch vegetarian by birth and choice like me, it sounded a little overwhelming because I have been battling for a long time to give up on coffee and I keep losing the will to lose the habit. My hosts also taught me their chant ‘Oh mane padme hum” which is supposed to bring good luck. Buddhists do a lot of things to bring good luck for them including hanging of the colorful flags with a prayer, in their homes, vehicles, in mountain pass, valleys, roads, gompas, odd places on top of the mountains and I even saw them in Gurudwara and the cave used by Guru Nanak when he was in Mechuka. It would be impossible to miss these colorful strips of flags in any Himalayan mountain at least in this part of the world. All these flags despite the difference in the color, size, and texture had the same prayer, pictures and inscription in it. There are also strips of white flags in these places which had a different prayer and we were told that these white flags are tied in the memory of the departed ones. Another queer thing I felt was that, my hosts who were only in their late forties and early fifties spoke about their own death without much ado about it. It appeared to me strange, for it is always considered a taboo topic from where I come from and the only people who talk about their own deaths are at least past their seventies. Maybe it is an understanding from the Buddhism or was typical for this couple or may be that life expectancy in that region is way too low. I can’t say for sure but they did seem very comfortable about the idea of their own deaths. 1) Staying with the locals give a unique perspective of the culture. And staying at a homestay is a good place to start with in absorbing local culture. I also believe tourism should empower and enrich the locals and choosing to stay in a home stay helps the local economy. You can find some of them here. 2) Getting a guided tour inside a monastery would be a good choice. Each monastery has a different theme and is filled with beautiful murals that convey various stories. 3) Losar is one of their most popular festivals and you can plan to visit Tawang during the Losar festival to enjoy the cultural festivities. 4) Tibet Market is a good place to get some artifacts. 1) The monks are happy to converse with tourists and don’t mind being photographed. But be respectful and take permission before you do so. 2) You may not believe with some of their practices. It is ok. Be inquisitive yet respectful of their choices. 3) I found the idea of personal space to be very less in Tawang. For Example, people would walk into the ATM and stand right behind you, or put the scarf around you in the altar etc. But this is normal in there and is not meant to be disrespectful.